INPUT CHARGE CONTROL: Bi-metal adjustable from zero charge to fully charged condition. Cycling Rate: 21/2 to 3 cycles per hour. ROOM TEMPERATURE BOOST: Bi-metal strip, selection variable from ealy to late or zero boost. THERMAL SAFETY DEVICE: Bi-metal - manual reset. The XL24 Storage Heater has an input rating of 3.40kW. It`s new and improved regulator creates an increased comfort level and improved running costs. The UK`s slimmest Storage Heater. Smooth curved styling for added safety. A manually adjusted charge regulator controls the amount of heat stored during the charge period. A room temperature boost control releases additional heat later in the day by allowing a greater airflow through the heater core. The room temperature boost may be operated manually or set to open automatically each day. The control knobs are positioned on the sloping rear top panel of the heater and are out of sight of young children. Frontal grille for efficient heat distribution. The heater must be fixed securely to the wall for safety and efficiency of operation. The feet may be concealed beneath carpeting or stand on top of suitable floor coverings. Simplified construction for ease of assembly. For a co-ordinated heating system the matching PLX range of panel convectors is available. Controls on the XL range are positioned on the sloping rear top panel, out of sight from children. The knobs incoroporate a cross bar ans raised pointer for ease of operation, and a simple setting guide os printed on the adjacent wall spacer. Storage bricks are packed seperately in pairs. Approx brick weight is 7.5kg each. 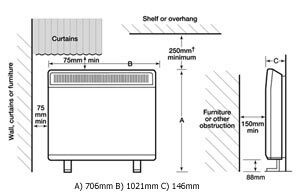 Do no cover or obstruct the surfaces of the appliance. Do not place objects in contact with the heater. The electrical installation must be carried out by a competent electrician and be in strict accordance with the current I.E.E. 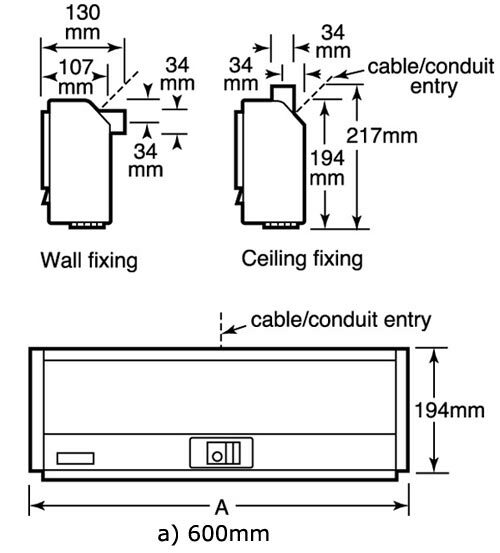 regulation for Electrical Equipment in Buildings. Located at front right hand end of base - accessible by removal of front panel assembly. 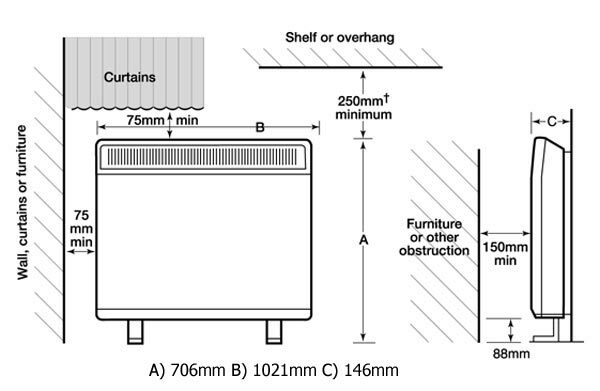 Hidden cable support straps at rear of heater allow neat supply cable connection from either side of heater. Before cleaning your heater, switch off and allow to cool down. Disconnect electrical supply to appliance. Use a damp cloth to clean the outside of the model. It is important that the fixing device chosen is appropriate to the wall material to which the heater is being fixed. Some modern internal building materials are very low-density block and require specialised fixing devices to provide a safe, secure installation.